Amorpha populi philerema Djakonov, 1923, Ann. Mus. zool. Acad. Sci. Russ., Petrograd 24: 104--115, pl. 4. Type locality: Termez, near Bukhara [Amu-Dar'ya River, southern Uzbekistan]. Wingspan: 80--120mm. 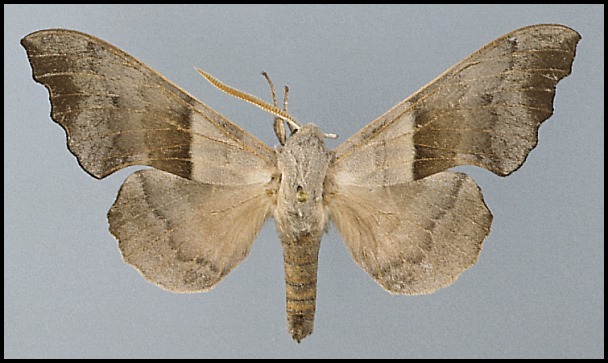 Resembles a very pale, poorly marked Laothoe populi populi, but with the rust-red hindwing patch of that species vestigial or absent. The male antennae are unusually long, being half the length of the forewing, which itself bears a very distinct antemedial band. In the male genitalia, the two apical processes of the sacculus are even more reduced than in Laothoe populeti (Bienert, ), although similar in outline; the aedeagus is more slender, less elbowed and with fewer and smaller cornuti at the edge of the vesica. Very little is known except that it is an inhabitant of river valleys and lake margins in the Hindu Kush and Pamirs. Bivoltine, or possibly trivoltine. Adults have been captured in late April and late June to August. OVUM: As Laothoe populi populi, but 2.42mm in diameter. Hostplants. Populus spp. of the subgenus Turanga (Derzhavets, 1984), such as the desertic Populus euphratica. Danner, Eitschberger & Surholt (1998) state that Populus pruinosa is the only host. PUPA: Undescribed. Presumably the overwintering stage. Known from eastern Turkmenistan (one specimen in NHMUK coll. ), the Ilya River valley of southern Kazakhstan (Serge Yevdoshenko, pers. comm. 2016), southern Uzbekistan (Djakonov, 1923) and Tajikistan (Derzhavets, 1984). 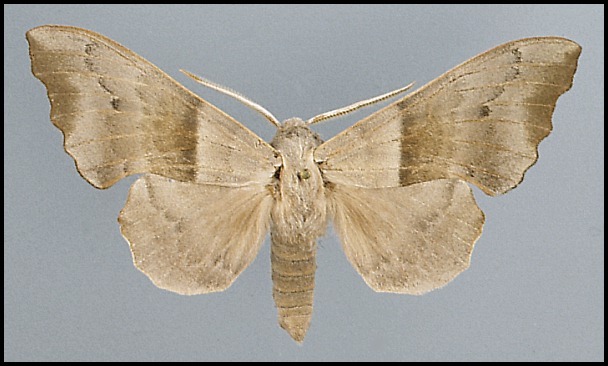 The morphologically similar but larger taxon described from eastern Afghanistan is now regarded as a distinct species, namely Laothoe witti Eitschberger, Danner & Surholt, 1998. Extra-limital range. Unknown, but it may also occur in Kyrgyzstan, north-western China, northern Pakistan (Hindu Kush) and most of the rest of the Tian Shan range.